Roger Zander wrote a brilliant article on Collections in Configuration Manager and some knowledge that aids in designing collection structure to reduce the workload of the ConfigMgr hierarchy. One thing that I remember evaluating a few years back was to leverage direct memberships to a Active Directory Security Groups to reduce the total evaluation time for collections. After a brief discussion I noted that there wasn’t any guide on howto create this manually (found a scripted method on SCUG.BE) for User Collections. As a prerequisite the AD Security Group has to be discovered resource. You can review the collection members of “All Users and User Groups” and see what groups are discovered – if what you are looking for isn’t there most likely you are required to tweak the AD Discovery methods you are using. 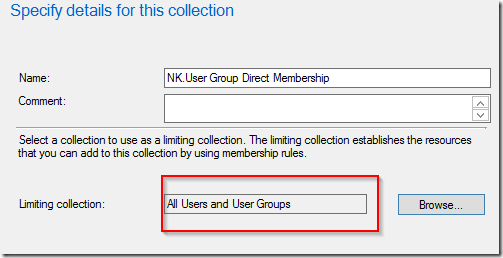 Once the resource is located you can choose to create a new collection and set the limiting collection to “All Users and User Groups”. All updates (full and incremental) can be removed to avoid any type of load. Choose to add a Direct Rule. 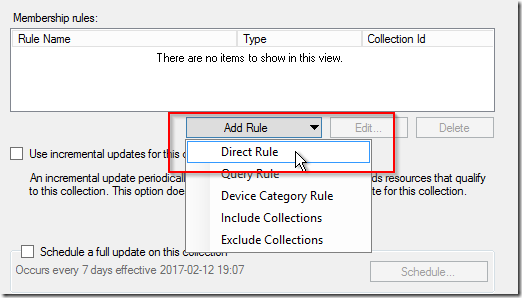 Change the default search for Resource class and Attribute name to User Group Resource and User Group Name. Enter the value you want and search all the resources you want to select. The alternative that is mostly used when searching the web is to create a query rule that requires that collection to be updated (either a full schedule, incremental or an external trigger). Whats the difference between these methods? A query requires that AD Discovery has updated the group memberships in the database (full or incremental – both will suffice) and once that is completed the collection has to be updated. Quite common (based on all the blog-articles) is to set an Incremental update for all collections that require a fast update. The limit for this is (according to ConfigMgr 2012 documentation) roughly 200 collections depending and inaddition the queue will increase with updates. Before the collection reflects the AD Security Group change there has passed a few minutes and once all the bells and whistles are done – the deployment is available for the user. 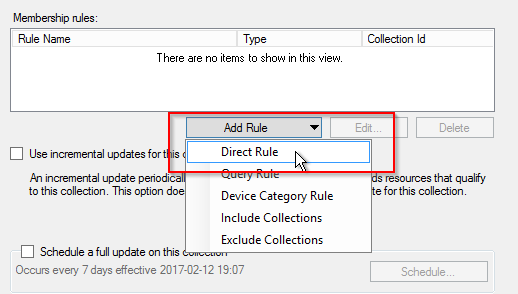 A direct rule will not require that the collection is updated at all, however if the AD Security Group is recreated it is required to update the collection with a new direct rule (as the resource will have a new ID). The user will not receive any deployments until their kerberos ticket has the AD Security Group membership update reflected. Most commonly this only happens during a lock / unlock or logoff / logon.